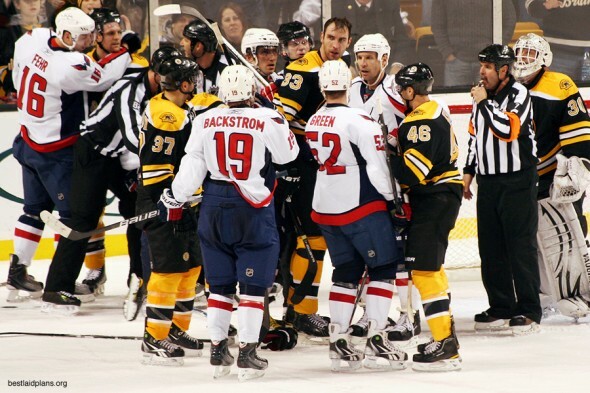 The Boston Bruins head to Washington following a disappointing split of their first two games against the Capitals. Both contests went to overtime and on each occasion the Black and Gold only mustered a single marker. That’s right; the NHL’s second-best offense through the regular season has managed exactly two goals on a rookie goalie with no postseason experience. Perhaps that’s this series’ narrative: Deep and dominant offense stymied by freshman ‘tender. Ken Dryden 2012? You be the judge. Still, despite some intimations to the contrary – Braden Holtby’s Conn Smythe candidacy isn’t set in stone. The Bruins have yet to truly test him – even with prodigious shot totals to that effect. The B’s haven’t found many clean shots in the slot or worn him out with second-chance opportunities. The Capitals have done an excellent job with the bend-but-don’t-break mentality of clogging the front of the net and blocking shots (fifty through two games). Perhaps the one saving grace is that the B’s have been just as stingy defensively as the Caps thanks to some superlative play from their blueliners and netminder. Tim Thomas has apparently turned back the clock to last spring thanks to a shutout and an undeserving double-overtime loss. Now, Mr. Thomas heads to Washington with the weight of the Bruins’ ineffectual attack on his shoulders. The Bruins – despite what amounts to a decent territorial advantage – have been primarily one-and-done in the attacking zone. The Caps have forced bad passes and are winning puck battles. Of course, after the Capital’s inability to cash in on their game-one successes with a conservative gameplan had pundits around the League questioning Dale Hunter’s decision-making. Why would a team with such high-end skill spurn the run-and-gun for physicality and defensive focus – and against the Bruins, no less? The answer came Saturday afternoon when the Caps took the Bruins to overtime again and, came away victorious. They shut down the B’s two top lines (including five twenty-goal scorers) and matched Boston’s intensity. Washington can hang with the Black and Gold – you can be sure of that. Take the physicality up another notch. The Caps want to play old-time hockey? The Bruins were built to impose their collective will on an opponent. They can ‘bully’ their way through Washington even in light of the Caps’ willingness to compete in the checking game. Simultaneously the B’s must have better zone-entries and be more tenacious on the forecheck. The B’s aren’t winning enough puck-battles in the offensive zone. Win at the dot. The Bruins were the best team in the NHL at winning faceoffs through eighty-two regular season games (54.5%) while the Caps were seventeenth at exactly fifty percent. However, through two games Washington has won 66 of 129 (51.2%). The Bruins (as mentioned in the series preview) were dominant in the season-series (winning over 57%). Jay Beagle has been dominating on the draw for the Capitals – some would say thanks to illegal positioning – but he has to be neutralized. Score from the top. None of the Bruins top-six had a point in games one or two. Twenty year-old leading scorer Tyler Seguin has looked inconsistent at best and the top line of David Krejci, Milan Lucic and Rich Peverley doesn’t seem to be on the same page. A possible solution would be to swap Seguin and Peverley to try and jump-start each line. Either way, the team hasn’t finished their opportunities and that must change if they are to head back to Boston with home-ice in-hand. No matter the solution – whether it’s just a matter of the correct number of ‘harrumphs’ in the locker room, a pregame séance involving The Chain or just a greater commitment to winning every puck battle – the B’s need to start putting goals on the board.